The reasons people come to counselling varies as people themselves. Many clients encounter distressing or stressful experiences and would like to express their emotions in a safe and confidential environment. These might include present circumstances of bereavement, separation, or other major life transitions, or experiences from the past, such as in childhood. Others seek help in dealing with specific psychological or behavioural issues, such as compulsive thoughts or difficulties relating to people. Some people seek counselling to help them explore a general feeling that they are unable to cope such as depression or phobia. Some would like to explore who they are and create a meaningful life. Many people are attracted to counselling as an opportunity to undertake personal growth and development with a trained, professional therapist and receive guidance and support. You may be experiencing painful symptoms and issues and find it difficult to tell someone we are here to listen to you. It is our role to listen, guide and support you with any issue you may be facing in your lifestyle. Listening to your issues will give us a better understanding of your current lifestyle and also a professional assessment. We believe that each and every person should have a chance to receive counseling to enhance the quality of life for themselves, families, communities, societies and the world at large. They will not say what they think you want to hear! So give us a call and allow us to make a difference in your life today. 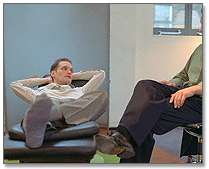 © 2006 - 2007 Counselling Centre . All Rights Reserved.